The larvae of this species are usually attended by ants from the following three genera, Paratrechina, Rhytidoponera and Tapinoma. The host food plants are a wide variety of native and introduced legumes, particularly on campus is the Phasey bean, Macroptilium lathyroides. Mature larvae various shades of green with dark green and whitish line, hairs present: head brown. 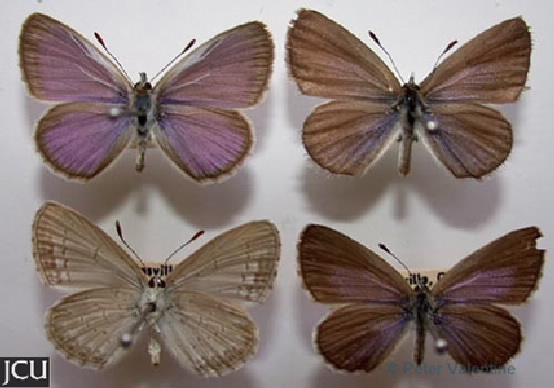 Adults bluish-lilac with dull brown outer margins; lower surface pale grey may be somewhat brownish, greyish-white band on both wings as well as some faint markings.